Head on eagle attack, Kenai Peninsula Alaska, NIKON D700 and SIGMA 150-500 mm APO OS HSM lens @ 350mm, 1/1600 sec at F8, manual metering, no flash, ISO 400. Subject distance: 21 m. Image Copyright 2011 Robert OToole / Robert OToole Photography. Eagle fishing at sunset, Kenai Peninsula Alaska, NIKON D700 and SIGMA 150-500 mm APO OS HSM lens @ 230mm, 1/1600 sec at F8, manual metering, no flash, ISO 640. Subject distance: 12.6 m. Image Copyright 2011 Robert OToole / Robert OToole Photography. Workshop one, October 25-29, 2011, 5 DAYS: $3399. Eagle pre-attack top bank, Kenai Peninsula Alaska, NIKON D700 and SIGMA 150-500 mm APO OS HSM lens @ 220mm, 1/1250 sec at F8, manual metering, no flash, ISO 2000. Subject distance: 17 m. Image Copyright 2011 Robert OToole / Robert OToole Photography. This workshop is for any serious bird photographer that would like to photograph tons of tame eagles in beautiful natural areas with almost unlimited opportunities away from crowds and other photographers. If you have ever dreamt of an opportunity like this don't hesitate to call or email now to join. Two great leaders provide both in-the-field and in-classroom instruction that will include at least two Photoshop sessions. Canon or Nikon we've got you covered. (In-the field instruction only on the Add-on day.) We expect both of these trips (and the Add-on day) to be sold out shortly. A non-refundable deposit of $1,000 is required to hold your spot. If you would like to join me for the experience of a lifetime, please let us know immediately via e-mail or by phone that you will be sending a deposit as I these workshops to sell out. Juvenile eagle about to break the sound barrier with an extreme high angle attack , Kenai Peninsula Alaska, NIKON D700 and SIGMA 150-500 mm APO OS HSM lens @ 290mm, 1/1600 sec at F8, manual metering, no flash, ISO 500. Subject distance: 32 m. Image Copyright 2011 Robert OToole / Robert OToole Photography. What's included: lots of eagles and lots of instruction. Ground transportation from the motel to the dock. As above we cover all boat fees and boat-related expenses but for the tips. Breakfast at the motel. We may be able to pick you up at the airport to save you the cost of a cab. Note: some folks may wish to rent a vehicle so that they can photograph on their own during free and nap time. This trip will be based in Homer, AK. What's not included: your round trip airfare from home to Homer. (Driving from Anchorage is recommended only for the adventurous....) The cost of your room. Meals other than breakfast. 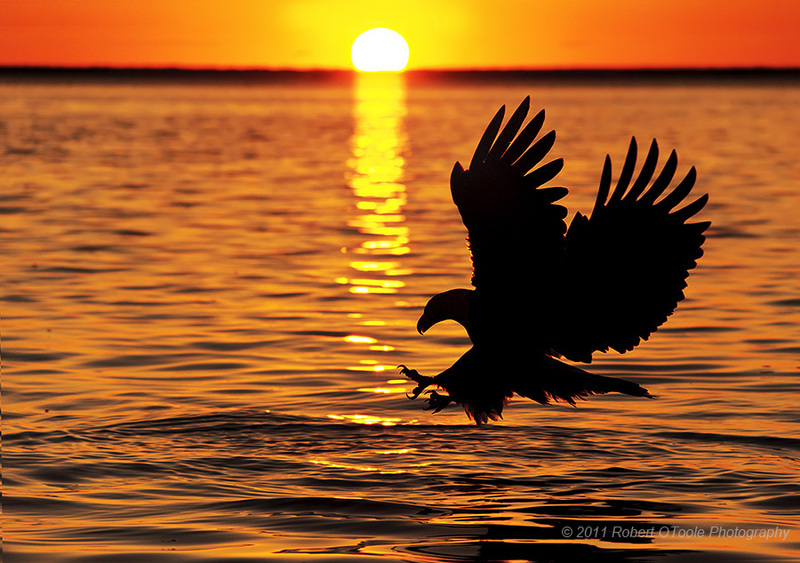 All the images in this post were made last month during my last Bald Eagle workshop series. Juvenile finishing off a meal, NIKON D700 and SIGMA 150-500 mm APO OS HSM lens @ 380mm, 1/1600 sec at F8, manual metering, no flash, ISO 1000. Subject distance: 11 m. Image Copyright 2011 Robert OToole / Robert OToole Photography.